Maserati’s first ever four-seater convertible – the stunning new GranCabrio – is set to make its UK public debut this coming Sunday, 4th October, at the Goodwood Breakfast Club. Just days after its unveiling at the IAA Frankfurt Motor Show, the new GranCabrio will form the centre-piece of a massing of Maseratis as the International Maserati Club descends on Goodwood for a relaxed Sunday breakfast with a collection of models spanning the Modena marque’s rich and illustrious history. Accompanying the Maseratis at this Sunday’s ‘Maserati Magnifica’ themed Breakfast Club tribute to the Trident will be other Italian icons, from Lambrettas to Lamborghinis, with undoubtedly the odd Ferrari, Alfa Romeo, Lancia, Fiat, ISO, De Tomaso Ducati and possibly some aircraft celebrating Italian machinery thrown in for good measure. The assembled Maseratis will be the stars of the morning, however, taking pride of place by lining up on the famous Goodwood grid. 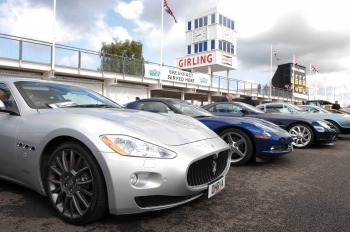 A reception for the International Maserati Club will also be held at Goodwood House the evening before. The links between Goodwood and Maserati are very close and stretch back through motor racing history. Prince Bira entered a Maserati 4CL in the very first race meeting at Goodwood on 18 September 1948, and many example of the marque have appeared at the West Sussex track in the years since. In more recent times, Maserati has been an enthusiastic supporter of the annual Goodwood Revival, as well as providing cars for the renowned Goodwood Festival of Speed. The Goodwood Breakfast Club is traditionally held on the first Sunday of every month, and provides the successful formula of a truly eclectic mix of vehicles and a tempting breakfast menu to whet the appetite of any motoring enthusiast. The event is free to attend, although direct vehicle entry to the motor circuit is restricted to those arriving in theme-appropriate vehicles, with all others being parked up a very short walk from the track, and all visitors are welcome. A website dedicated to the Goodwood Breakfast Club (Goodwood.com/breakfastclub) is available on-line, highlighting updates on each monthly theme, and enabling visitors to pre-register to secure easy parking and breakfast access. Two further Goodwood Breakfast Club meetings remain for 2009; ‘Souped-up Sunday’ on 1st November for modified and custom vehicles of all ages, plus the ‘Breakfast Club Christmas Cracker’ on 6th December, attracting any cherished car, preferably with a heater and plenty of boot space for your Christmas shopping.